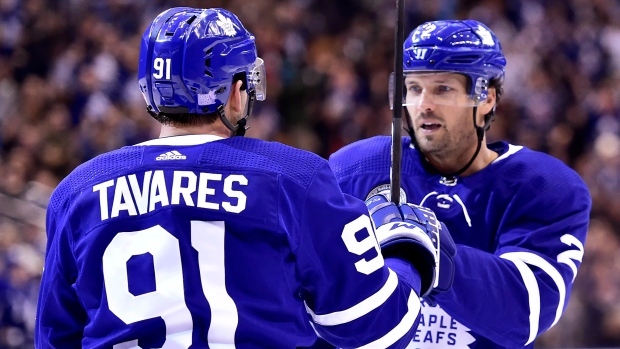 TORONTO – At the quarter mark of their season, the Maple Leafs have come mostly as advertised – a fast, young team with high-end offensive skill that’s propelled them to the third-best record in the NHL. While cautiously optimistic about their early success, it’s not enough accomplishment yet to be truly satisfying for the Leafs, even on the heels of a three-game sweep through California last week. If anything, the Leafs are even hungrier to fine-tune as they return home to face the Columbus Blue Jackets, who have also won three straight, on Monday. Toronto is just 5-5-0 at Scotiabank Arena this season, compared to a league-best 9-1-0 on the road. Rielly brought up the Leafs’ home record multiple times on Monday, but wasn’t sure how, exactly, Toronto could translate what worked so well in three straight wins over Los Angeles, San Jose and Anaheim (by a combined score of 12-5) into Monday’s contest. While Rielly has established himself this season as one of Toronto’s best players, he’s been more productive offensively on the road. Rielly paces all NHL defencemen with 25 points so far, but only eight of those (three goals, five assists) have come in Toronto. If he’s hoping to start turning that tide, Monday is a good place to start. At the moment, Rielly is riding a five-game point streak with three goals and four assists since the Leafs’ last home game on Nov. 9, and most recently scored the game-winning goal in overtime on Friday over Anaheim for his ninth score of the season. That puts Rielly out ahead of all defencemen in goals too, with the second-best plus-minus (plus-10) rating among blueliners. But those benchmarks alone after this first 20-game segment of the season hasn’t made the 24-year-old a clear-cut number-one defenceman yet, at least in his own mind. “I don’t know [if I’m there]. I guess I’ll let you know when that happens,” Rielly said. In accounting for Rielly’s current run, head coach Mike Babcock didn’t anoint him with any grand new label, but said he sees some of the defenceman’s former self in his current game. Leaning on Rielly as a backbone of their group, the Leafs feel primed to keep banking points into this next quarter, where a challenging Columbus team looms. The Blue Jackets are right behind Toronto in the standings, with 26 points to their 28, and they’re a similarly strong road team (7-2-1). To keep their three-game win streak alive, Toronto aims to keep emphasizing more shots on net, and not squander time in the offensive zone with too many passes. The Leafs have peppered goalies with 30 or more shots in eight of their last 10 games now, while averaging 31.7 per game. “Just trying to get lucky I guess,” said Rielly, who leads all Leafs defencemen with 59 shots this season, of the uptick. “Jake [Gardiner] and I have been talking about things we can do better offensively to contribute a little bit more, so hopefully we can build on that going forward. John Tavares, who has 10 points (five goals, five assists) in his last eight games, doesn’t think Rielly has to work all that hard to make a big impact for the Leafs. Saying his game is “on another level right now,” Tavares is eager to see himself and his teammates try to match that as they enter into a new phase of the year.